It’s time to start stretching those livers, Los Angeles! On Saturday, December 31st, craft cocktail destinations across the city are welcoming the new year with champagne-soaked events that include masquerade parties, multi-course dinners, and spirited trips around the world and back in time to the 1920s. For a comprehensive list of dining options on December 31st, be sure to visit our friends at dineLA for the Mother of All New Year’s Eve Restaurant Round Ups. Wherever you end up on New Year’s Eve, please celebrate responsibly. You can Go Metro with special overnight 24-hour rail service on December 31st and January 1st, and of course a taxi is just a phone call away. Cheers to a fantastic 2012! Located in the lobby of the O Hotel in Downtown LA, Bar | Kitchen is offering a three-course New Year’s Eve dinner menu for $45. To pair with Chef Vahan Tokmadjian’s seared sea scallops, beef short rib pot roast, and almond & pear upside down cake, B|K is featuring a unique selection of small production bubbly and craft champagne cocktails. 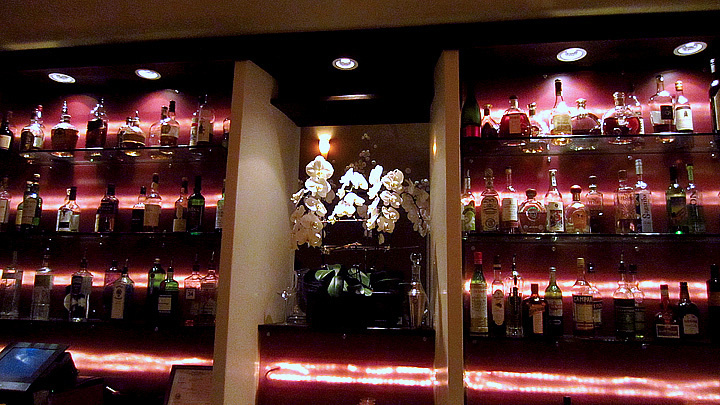 Reservations: 213.784.3048. The adult wonderland that is The Bazaar by José Andrés presents a Spanish Masquerade that includes a full Dinner Reception with roaming carts, various food stations, and passed items from 8-11pm. Guests can opt to skip the food and enjoy cocktails and dancing in the Albert Room beginning at 10pm. At 11pm, the doors connecting the Bazaar and the Albert will open and everyone can roam freely throughout the Spanish Masquerade. Dinner reception: $250 per person. Albert Room tickets: $100. Bottle service available, call for pricing. Reservations: 310.246.5548. 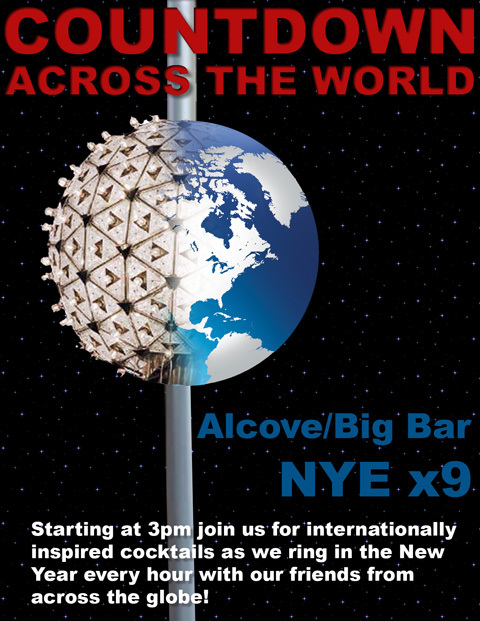 At Big Bar, nine is your lucky number for the second annual New Year’s Eve Countdown Across the World: nine time zones, nine countdowns, nine cocktails and nine playlists. The countdowns start at 3pm with the Hüsker Dü (Kanon Organic Vodka, Aperol, lemon, bitters) and travels all the way across the map every hour until midnight, when Los Angeles welcomes 2012 with a champagne toast and the Historic Core: Rittenhouse 100, Lairds Bonded Applejack, Green Chartreuse, Dolin Rouge, Angostura. To tempt thirsty Angelenos, Big Bar is posting pics of the NYE cocktails on its Facebook page every day until New Year’s Eve. Santa Monica’s Copa d’Oro gets the party started at 8pm, with music by DJ Tommi starting at 9pm, and more room to groove on the expanded dance floor. Reservations are available for parties of six or more. Complimentary bottles of champagne and party favors for all reservations. $20 cover. Reservations: 310.576.3030, or email info@copadoro.com. 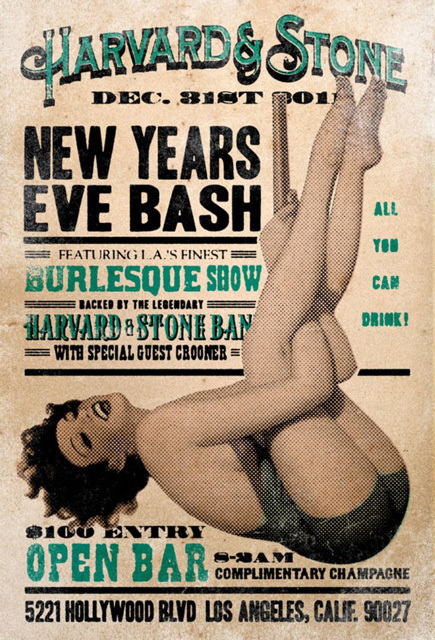 On New Year’s Eve, The Edison presents the Bootlegger’s Ball, featuring Lyndsay and the All-Nighters, aerialists, dancers and “a host of gifted eccentriques to accompany you on a unique and unforgettable journey into 2012.” Tickets include The Edison’s legendary Midnight Toast. Tables include desserts and special New Years favors. Tickets start at $75. Doors at 7pm. Table reservations and pricing: 213.613.0000. 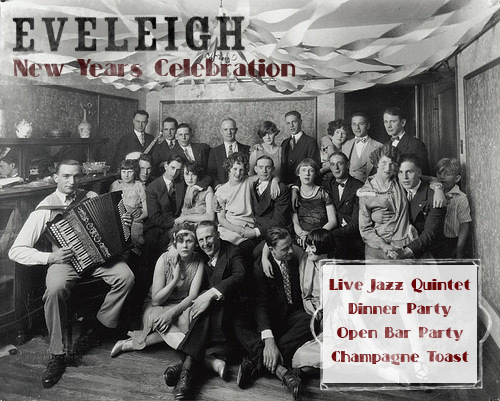 The Wayback Machine will be in effect at Eveleigh, which is not only presenting a Roaring Twenties Soirée, but is also thoughtfully serving an all-day brunch on January 1, 2012. Both dinner options include a 5-course Prix Fixe Menu; the Late Seating includes a champagne toast at midnight and access to The Uptown Five jazz quintet and NYE festivities starting at 9:30pm. Early Bird Seating: $75. Late Seating: $95. Reservations at OpenTable or call 424.239.1630. The Cocktail Party features a 1920s-inspired cocktail menu created by head barman Dave Kupchinsky, an open bar from 10-11pm, live jazz quintet entertainment and piano, countdown to 2012 and complimentary champagne toast. 1920’s cocktail attire suggested. On New Year’s Day, Eveleigh is serving an All Day Brunch with classics from the dinner menu to help with recovery from the night before, as well as REHAB with the best hangover remedies from the bar. 11am-10pm. Reservations at OpenTable or call 424.239.1630. 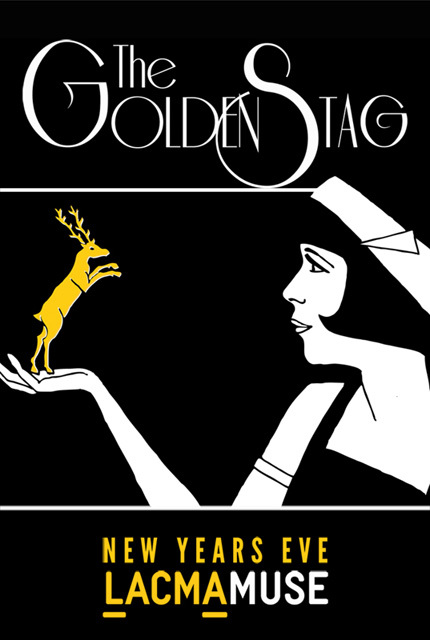 Take the Wayback Machine to the historic Park Plaza Hotel, where LACMA Muse and Sypher Art Studios present The Golden Stag, a Roaring Twenties style party. Fellas and Flappers: $50 (includes champagne toast); Big Daddies and Leading Ladies: $150 (includes reserved table service with hosted bar). 8pm. Tickets: 323.857.6010. Four words: gangsters, dames, booze and gambling. That’s what La Descarga has in store for guests at its Havana Nocturne, a 1920’s-themed night that includes premium open bar, Latin orchestra, burlesque dancers, passed apps, and a Havana-inspired casino. The three biggest chip holders at the end of the night will receive some great prizes. The dress code is formal and the theme is gangsters and dames of the 20’s. Tickets are $200 per person, includes gratuity, and are limited to 150 guests. 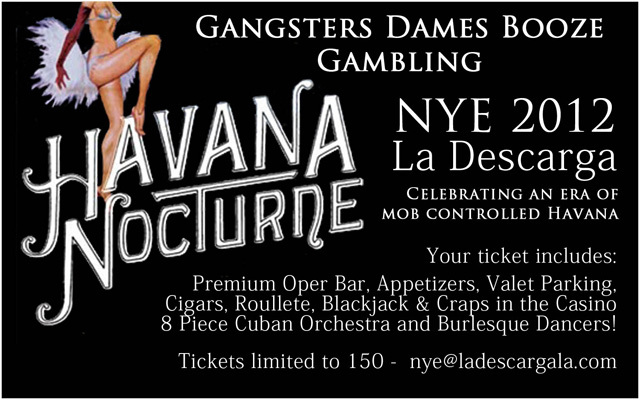 To purchase tickets, email nye@ladescargala.com. 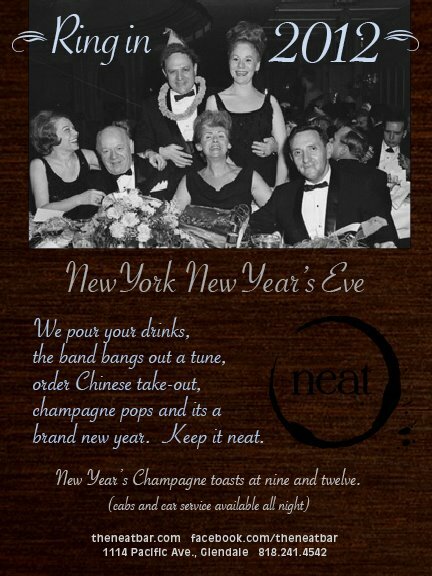 On New Year’s Eve, Aidan Demarest is keeping it simple at his Glendale bar Neat: no cover or reservations, live music, champagne toasts at 9pm and midnight, and Chinese takeout to soak up all the spirits (served neat, of course). What’s the over-under on how many times Don’t Stop Believin’ gets played that night? 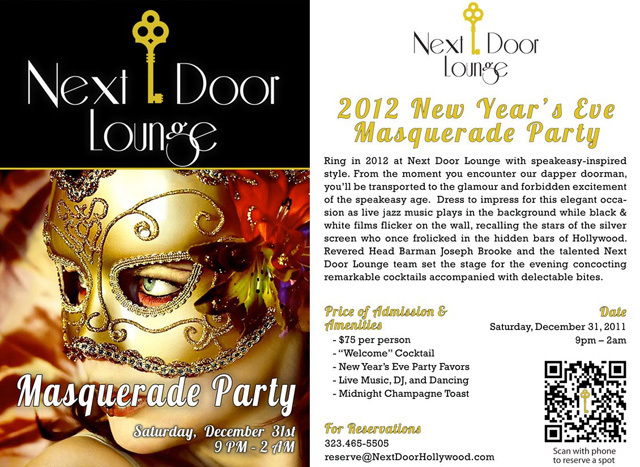 Looks like the Wayback Machine will be in overdrive this New Year’s Eve as Next Door Lounge transports guests to a glamorous Masquerade Party set in 1920’s Hollywood. Live jazz and classic black and white films provide the backdrop as you enjoy cocktails by Joseph Brooke and bites from the Next Door staff kitchen. Tickets are $75 per person and include a welcome drink, masquerade mask, party favors, and a midnight champagne toast. Ticket reservations: reserve@nextdoorhollywood.com. Picca welcomes 2012 with a New Year’s Eve Dinner Party that features a special six-course menu, entertainment, party favors, raffle prizes, a live salsa band from 10pm to close, and more. Dinner will be served family style, featuring dishes such as Causa Escabeche, Octopus Tiradito, a Pisco Shooter, Camarones ala Parrilla, and Estofado de Carne. The first seating is $95 and includes the prix fixe menu plus wine pairings and a cava toast. The second seating is $145 and includes the previous plus a cocktail. First seating 6-7pm; second seating 9:30-10:30pm. Reservations: 310.277.0133 or email info@piccaperu.com. 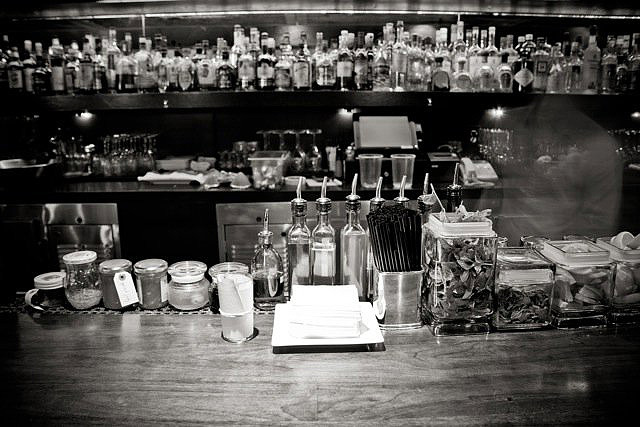 From 10:30pm to 1:30am, Picca is hosting a Late Night Industry Party with open bar (beer, wine, pisco shots, punch) and bites for friends, family and industry patrons for just $40 per person. Space is limited and pre-paid reservations are required. At Providence, Chef Michael Cimarusti ushers in 2012 with a sumptuous Market Menu that rings in the new year with delicious style. Market Menu items include wild Japanese buri, wild New Zealand John Dory, and American Wagyu style beef. Early seating is 5:30 and 6pm, late seating at 8:30 and 9pm. $195 per person, $260 with wine pairing. 323.460.4170. Other NYE specialty flights include single malt Scotch, rum and American whiskey. Reservations after 9pm will receive a complimentary glass of cava. Reservations suggested, walk-ins are welcome: 323.933.5300. At Rivera, diners will find a New Year’s Eve menu of traditional holiday dishes reinvented with a modern Latin twist, such as a chestnut mole sauce with a classic ballotine of chicken and a Buche de Noel transformed with passionfruit sponge and coconut “snow.” Rivera’s mixologists have festive cocktails in the works and of course the champagne will sparkle. Early seating is 6-8pm and features a five-course menu. Evening seating is 8pm and later with a seven-course menu. Early seating $100, evening seating $125. 213.749.1460. Punch reception at 5:30pm, World Whiskey Flight at 6pm, event opens to the public at 8pm. 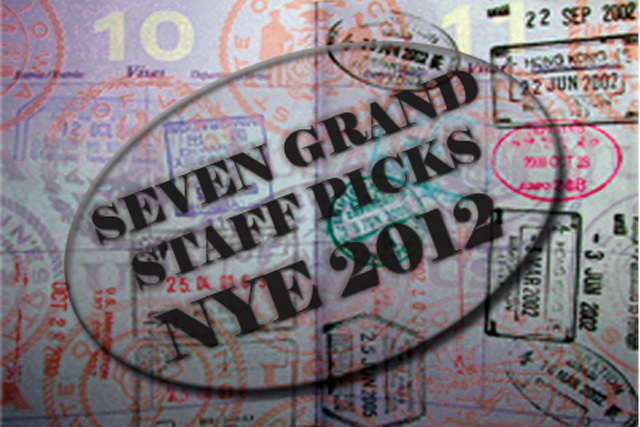 Tickets are $120, includes gratuity and appetizers: http://7grandnye.eventbrite.com. At The Tasting Kitchen on Abbot Kinney, Chef Casey Lane is offering three five-course menu options with French, Italian, Moroccan, and Spanish inspired flavors that will appeal to meat lovers, seafood fans, and vegetarians alike. The “All” Menu features Apicius Duck Confit with kumquat preserve, and puntarella; the Pescatarian Menu features Tagliarini Nero with squid and serrano chile; and the Vegetarian Menu features Truffled Egg with polenta and fall vegetable salad. Wine pairings for each menu are also available. $90 per person, $45 for wine pairings. 310.392.6644. 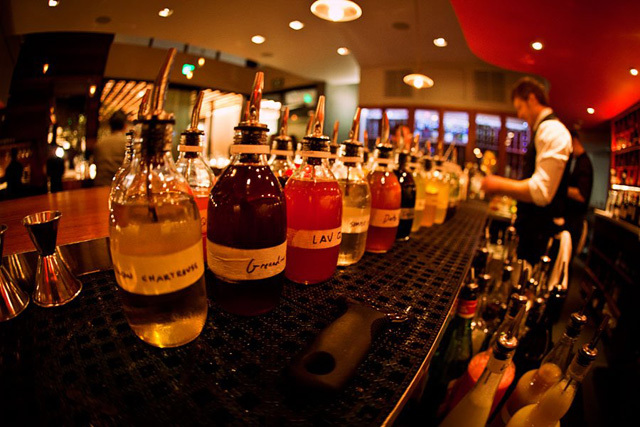 From its location in the back of Cole’s, The Varnish will be dancing to its singular beat on New Year’s Eve with a Soul Shakedown Party that features unlimited craft cocktails, bottomless Bols Genever punch and the 2nd Annual Varnish Twist Contest, hosted by Varnish GM Chris Bostick. Rare groove and soul classics will provide the imbibing soundtrack to the event, which will take place from 9pm-2am. Tables in the intimate venue are available for parties of two, four and six. Seating for New Year’s Eve is limited, reservations are a must. $125 per person (gratuity included). 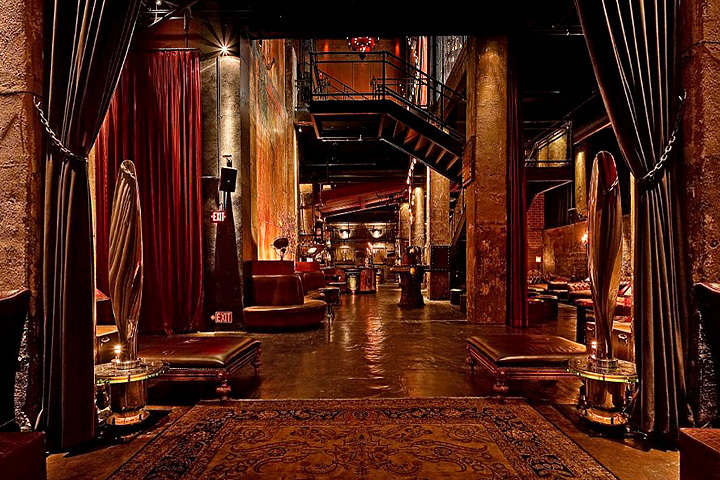 For reservations contact Chris Bostick at 213.622.9999, or email thevarnish@thevarnishbar.com. 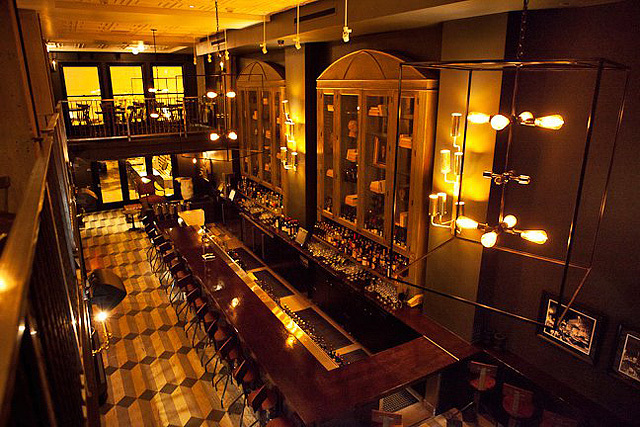 Wood & Vine is presenting a five-course or seven-course prix fixe and two seating options for its New Year’s Eve menu. First seating is 6-7pm and includes a Celery Root Shooter, Dungeness Crab Salad, House-Made Spaghetti, Seared Branzino, Paso Prime Rib Eye, and Butterscotch Pot de Crème. The second seating is 9-10pm and includes the previous plus Roasted Scallop, Roasted Venison Saddle, and a complimentary champagne toast at midnight. First seating $55; second seating $75. 323.334.3360.